I will post my review tomorrow. I will post my review of this wonderful Christmas story tomorrow. Roseanna M. White pens her novels beneath her Betsy Ross flag, with her Jane Austen action figure watching over her. When not writing fiction, she’s homeschooling her two children, editing and designing, and pretending her house will clean itself. Roseanna is the author of a slew of historical novels and novellas, ranging from biblical fiction to American-set romances to Edwardian British romances. She makes her home in the breathtaking mountains of West Virginia. You can learn more about her and her stories at http://www.RoseannaMWhite.com. Some Christmas stories can be sappy but this one wasn’t at all. It made me laugh and cry. This story starts with a group of 5 women who are in a book club together. Abby Wentworth is the one who keeps the group together. Right after Thanksgiving she dies unexpectedly from an aneurysm. Right before she died she had made angel ornaments for the other 4 women. Her husband takes them to the women and these bring the women closer together and encourages them to come up with a Christmas project they must each complete. I received this book from Revell for a fair and honest opinion. Abby Wentworth is the glue that holds her book club together. So when she unexpectedly passes away on the cusp of the Christmas season, the rest of the women in the group are stunned, saddened, and sure that, without her, the group can’t continue. They gather “one last time” to open gifts Abby left behind, little knowing how it will change each of their lives–forever. This had many twists and turns that had me guessing the whole story. I kept wondering if the young boy was going to live or die. This is the first book I have read in this series but I hope to read more of them. I received this book from Firsttoread for a fair and honest opinion. Mallory Book 12: Blind Sight is the twelfth NYPD detective Kathy Mallory novel from New York Times bestseller Carol O’Connell, master of knife-edge suspense and intricate plotting. Fans of Karin Slaughter and Lisbeth Salander, heroine of Stieg Larsson’s Millennium series, will be thrilled by New York’s darkest cop. ‘Carol O’Connell is a consummate storyteller – a unique talent who deserves to be a household name’ – Val McDermid A very egalitarian killer. The nun is dead, her body lies on the mayor’s lawn. And it isn’t alone. There are four of them altogether. They’ve been killed at different times, in different places, and dumped there. There should be five – but the boy is missing. One second he was there…Jonah Quill, blind since birth, sits in a car driven by a killer and wonders where they are going. Though he is blind, Jonah sees more than most people do. It is his secret, and he is counting on that to save his life. Then gone. Detective Kathy Mallory is counting on herself to save his life. It takes her a while to realise that the missing-person case she is pursuing is so intimately connected to the massacre on the mayor’s lawn. But there’s something about the boy she is searching for that reminds her of herself, all those years ago. She will find him – she just hopes it will be in time. I think these small prayers are helpful for the children and the parents that read this book. They start with morning prayers through night time prayers. This is a great read. These short prayers helped during a trying time this week. I will enjoy reading them again. I received this book through First Look blog tour for a fair and honest opinion. This is a board book. So nice. I loved this quick and light historical mystery. I loved how it took place in a radio station. That was fun to learn more about some of the stars that began in radio. I look forward to learning more about Viv and Charlie in more stories. They were so good together. It was sad to see Viv falling for the slimy actor and she had to learn there is more than just acting. This has a great mystery and is fun and light hearted. I received this from Sourcebook for a fair and honest opinion. One commenter will win a copy of this book. Tell me what book you are reading now and leave contact info. I will pick a winner on September 28. About the Author: Cheryl Honigford has always loved old-time radio (and classic movies) and claims to have the nagging suspicion that she was born at least fifty years too late. She has a degree in journalism from Ohio State University and lives in northern Illinois. Rachel HauckRachel Hauck is a USA Today Bestselling author. 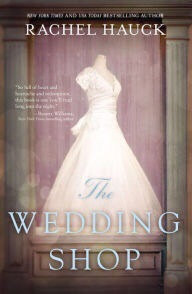 Her book, The Wedding Dress, was named Inspirational Novel of the Year by Romantic Times and was a RITA finalist. Her book Once Upon A Prince was a Christy Award finalist. I’d love to hear your thoughts! Connect with me at http://www.rachelhauck.com.